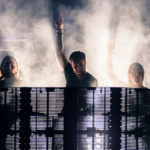 As Swedish House Mafia continue their monumentous return and ramp up excitement for their upcoming three-day run in their hometown of Stockholm, a new angle appears to be taking place. On April 14, the trio posted an image of their iconic three-dot logo, this time filled in with a star-shaped pattern. The tweet’s only text reads”30.4 – 5.5 2019,” a date range that coincides with their Stockholm shows. Fans were quick to research the unidentified logo and discovered that it’s that of Fotografiska, a museum of photography in Stockholm. While the trio didn’t disclose exactly what the date range and Fotografiska logo mean, many are speculating that the supergroup could have a photography exhibit that’ll take place in their hometown to pair with the performances there. There are also Fotografiska locations in New York, London, and Tallinn, leaving fans in other countries like the U.S. hopeful that an exhibition could pop up there, too.